A good friend said to me, "I don't get where you are with your diabetes. I have heard you say you are type 2, pre type 2 and I am confused." I think that puts me right smack into the middle of the type 2 universe. Confused. Years ago, at a physical, the GP told me my blood sugar was elevated. Fasting sugar were 108. I laughed. I would kill for my kids fasting blood sugars to be 108. 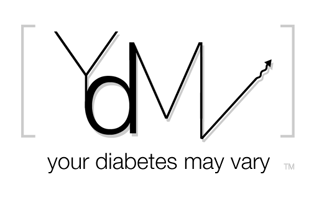 As we talked the Doc said, "You probably know more about diabetes, with two T1D kids, than I do." Maybe, I probably do know more about living with kids who have type 1 than he does but that isn't what we were talking about. I was confused. So we talked more. He referred me to an endocrinologist. It took six months to get in. If this was remotely serious, why the hell does it a half a year to get an appointment? And how do you stay motivated to take action in that half year? Confused. The endo was a nice guy. While I was there as much to interview him about being an adult endo for when my kids when they leave Children's Hospital of Philadelphia, as for myself, we talked about my health. We talked about my family history with type 2, that I had come down from 200 to 180 pounds through diet modification, mostly small actions. I told him what my fasting sugars were (hey there are meters all over our house, I was curious.) He said stay the course on diet and work to loose a few more pounds. He said he didn't need any more blood work to know I had type 2 but I didn't need to test fasting blood levels. So keep being good, just a little more of the same, don't test the morning blood sugars, and oh, you are type 2. Confusing. Since then, I have periodically checked my morning glucose. I became obsessed getting a masters degree in health communication. I ate much better when I was in a nutrition class as part of that program. Much of the nutrition class didn't stick but the idea of looking at meals as a plate did. I try for at least a half plate of green stuff and no more than a quarter of protein. I can do that. But since then I've exercised less and obsessed more as I try to be useful with that degree. Not to long ago I wore a continuous glucose sensor for a week. From it, I know, if I was type 1, I would give myself a larger meal insulin bolus to manage long, slow recovering, post meal spikes. I have read up on T2D drugs, some I understand, some I don't, some have side effects like weight gain that make it hard to feel successful at controlling health. My numbers are creeping back up. I think, while not perfect, I was more or less successful at what the endo wanted me to do a few years ago. Yet, I find it really hard, no - almost impossible, to give myself any credit for that success. All I see are the numbers coming back up and feel guilty about and the occasional stress induced Oreo binge. Yesterday in a meeting, I stared at a muffin off and on all day. I wanted it in all kinds of ways. In the end I didn't eat it. I had a half a plate of green, a little protein for lunch and wanted the muffin. I need help staying successful, not perfect. It's time to do more, more activity, that 'in nutrition class' attention to diet, some kind of meds and mostly I need peers to help take the next steps to be successful. I know this about diabetes - I need help, not to try to go it alone. I'll go back and see the Docs, maybe an educator and be more open with peers. Maybe I am not so confused. Thanks to everyone who joining in the Spare a Rose campaign. Our community showed real strength. We came together, not a patents, pharma. and caregivers but as a community seeking to help kids in need. Our community is amazing. Together we will double the goal of Spare a Rose for 2014. 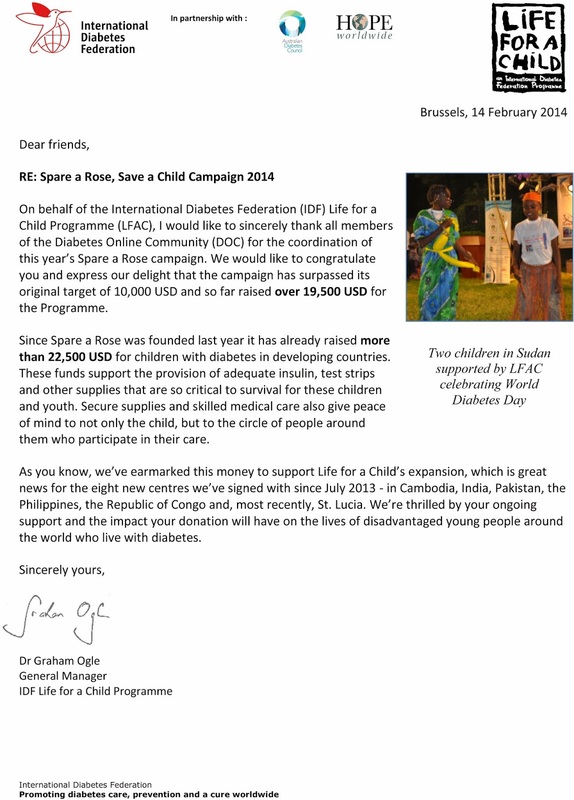 Please read the attached letter from Graham Ogle of Life for a Child. It is a Valentine's Day card for us all. ps. There is still time to give, there is always a need. When I heard the goal for our community’s Spare a Rose campaign I had doubts. That was silly. By coming together and making ‘Rose ours, we have exceeded an ambitious goal. I imagine in in addition to our house smelling of roses this Valentine’s Day, the home of a family, some where in need, smelling like insulin. like LIFE. Let’s dig in for a Valentine’s Day push. Let’s get do it again. We can. 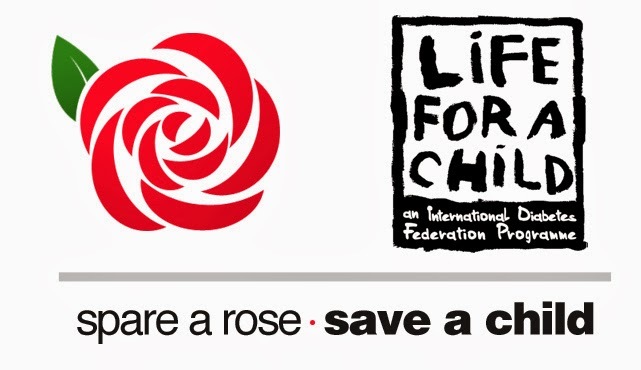 I am proud to be a part of the Spare A Rose Community, I'm doubling down to Spare Roses and Save Children. There is time left to Spare another Rose.